The role of youth in their health and the health of their communities was the theme of the 4th Annual Rodham Institute Summit, held Oct. 20 at THEARC in southeast Washington, D.C. Community leaders, clinicians, and students presenting at the day-long event emphasized how to engage and lift up young people living in underserved areas. The empowerment of youth is the core mission of the Rodham Institute, which works to improve health equity in Washington, D.C., through community collaborations, health education, and service learning, said Jehan “Gigi” El-Bayoumi, M.D., RESD ’88, founding director of the Rodham Institute and professor of medicine at George Washington University’s (GW) School of Medicine and Health Sciences (SMHS). Millennials face many misconceptions, but if given a real chance to engage and be heard, they can make a world of difference, said Rain Henderson, CEO of Clinton Health Matters Initiative, which works to improve people’s health and well-being. However, young people living in impoverished areas have many obstacles to their health. Social determinants, such as poverty, water and air quality, and educational status, all make a difference in well-being, El-Bayoumi said. In addition, mental health is not separate from physical health. That’s why programs such as the Youth Escape Arena, Inc. and Little Friends for Peace (LFFP) work to create positive environments for disadvantaged youth. During a panel discussion on youth advocacy, MJ Park, founder and executive director of LFFP, spoke about the program’s Peace Classes, an environment that allows kids to go inward to find peace. Park gave the example of a 5th grader who was acting out. After getting her to open up about her anger, Park learned the young girl could not read. “When you can’t read, when you don’t feel like somebody, you’re angry and you lash out,” she said. Samantha Simpore, founder of Youth Escape Arena, added that labels such as “at-risk” can be toxic. “Our kids are ‘at promise,’ ” she said. “The environments which they come from are at-risk. “When kids are empowered and know they can make an impact in the world, you will be surprised in the magic that can happen,” she added. Pipeline programs, the topic of the second panel discussion, allow educational institutions, such as GW, to help young adults realize their full potential. Nicholas Dingle, a 17-year-old Suitland High School student from Forestville, Maryland, served as an example of someone who gained from such programs during the panel discussion. Dingle participates in Rodham’s Health, Education & Leadership (HELP) program. Through HELP, Dingle has worked on social impact research projects, and during the discussion he expressed appreciation for the ways in which the program has enabled him to develop into a “well-rounded” member of his community. Alexia Charles also addressed the importance of the programs from the perspective of a participant and later leader. The third-year M.D. program student at SMHS worked with the D.C. Health and Preparation Program, mentoring high school students in the D.C. area. “It was a great experience for me to be able to expose them to health care careers, to be a role model for some of them, to just give them an idea of what they could do, what the opportunities are,” she said. There’s also a need in such communities for health workers who are truly connected to the patient population, added Daniel Mays, SMHS ’15, resident at Mount Sinai Hospital in New York. That’s something he saw first-hand in Uganda, where community health workers were unpaid volunteers who simply wanted to help others. Health providers, from local health workers up to physicians and surgeons, must say, “this is not just a group of people that’s going to utilize my services and pay me, but this is a group of people I want to see thrive,” he said. During the summit, the Rodham Institute presented three awards totaling $30,000 to support projects linking community members, organizations, and leaders with academic partners at GW. Awards went to ventures that provided support for youth mental health first aid instructors, engaged communities to enhance asthma care, and created toolkits for families of LGBTQ youth. The Recreation Wish List Committee provides safe, state-of-the-art recreation centers to help underserved youth. 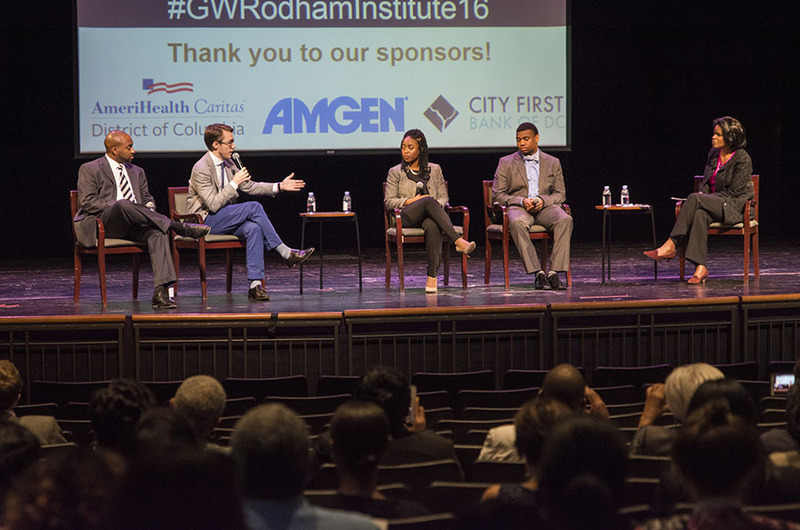 GW’s Rodham Institute Hosts Third Annual Summit to Promote Health Equity in Washington, D.C.
Rodham Institute Hosts Summit to Promote Health Equity in Washington, D.C.